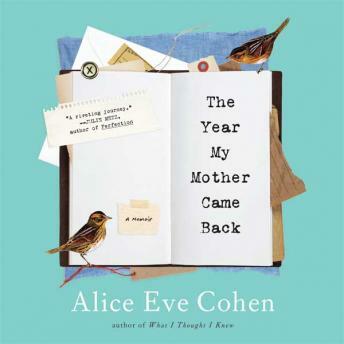 Thirty years after her death, Alice's mother appears to her, seemingly in the flesh, and continues to do so during the hardest year Alice has had to face: the year her youngest daughter needs surgery, her eldest daughter decides to track down her birth mother, and the year Alice gets a daunting diagnosis. As it turns out, it's entirely possible for the people we've lost to come back to us when we need them the most. Although letting her mother back into her life is not an easy thing, Alice navigates it with humor, intelligence, and honesty. What she learns is that she must revisit her childhood, and allow herself to be a daughter once more, in order to take care of her own girls. Eventually, understanding and then forgiving her mother's parenting transgressions leads her to accept herself and to the realization that she doesn't have to be perfect to be a good mother.